Pasta, Italy’s amazingly versatile food can be served 365 different ways a year. Adapting nicely to changing temperatures and seasonal ingredients. Timing is everything with pasta, so Italians never start the pasta boiling until the guests have arrived and all is right in the world. “Pasta must never wait for the guests” they say, “guests should wait for it.” I like the double duty Italian expression: Butta la pasta—“throw the pasta”—that is said literally when it’s time to add the pasta to the boiling water but also figuratively to mean the time is right. These three recipes are especially perfect for October, when the air is autumn crisp and pumpkins and pears are in season! Carbonara, one of Rome’s most famous and beloved pasta dishes, gets its creaminess when the hot pasta is tossed with raw egg, punctuated by crisp bits of pancetta and a shower of grated cheese. What’s not to love? It would be difficult to improve on that magical combination of simple ingredients, but this first recipe: Pumpkin Carbonara, a vegetarian version of the classic, just might sway your loyalties. Sweet caramelized onions take the place of pancetta with pumpkin adding an autumnal note, plus even more creaminess. When the weather turns cool, I find yourself seeking out all types of pumpkins and squashes --kabucha or butternut squash or baby blue pumpkins are all delicious alternatives to sweet pumpkin-- and making this dish again and again. 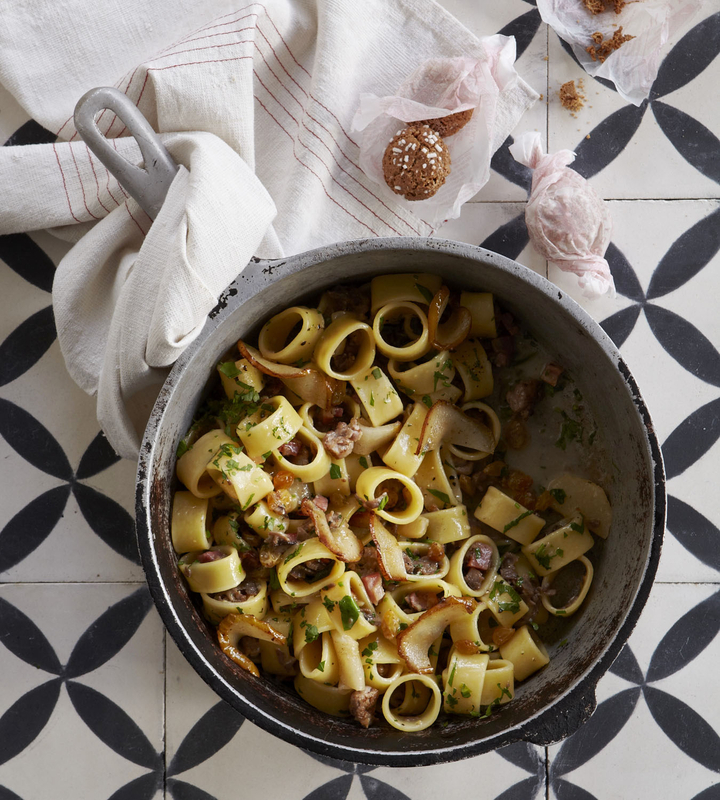 The second recipe: Pasta with Pear and Sausage is made with the odd-- but oh-so-tasty-- assortment of ingredientsused in the filling for casconcelli, ravioli fromBergamo, Lombardy. Sausage, salami, roast beef, pears, raisins, and crushed almond cookies create an exceptionally flavorful sauce for any shape pasta. The concept of using ravioli filling as a condiment for pasta is very liberating! The famous Italian chef Gualtiero Marchesi, first introduced ravioli aperto “open ravioli” back in the ‘80s. 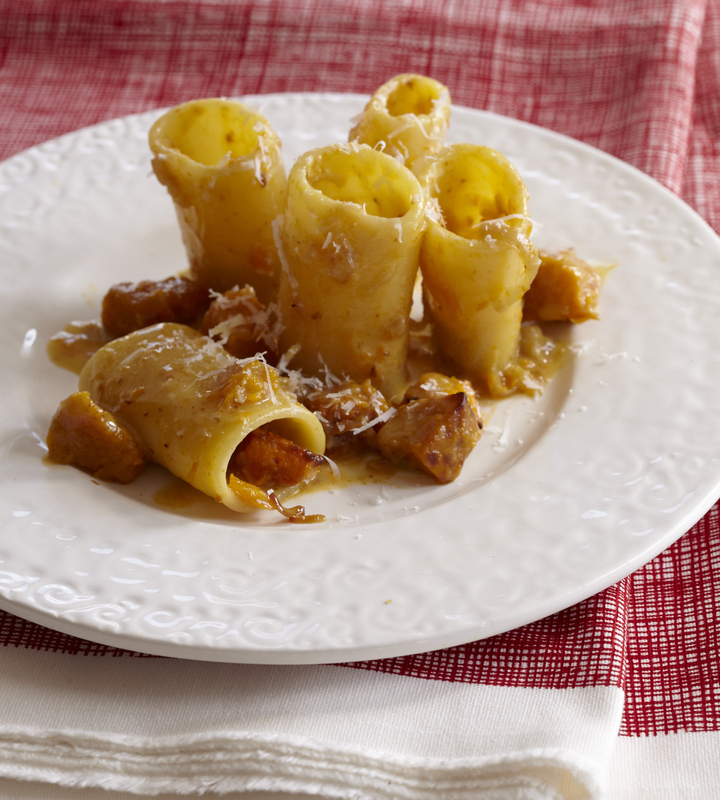 Nowadays, many Italians, pressed for time, forgo ravioli making and turn the filling into a free-form sauce for pasta. The flavors are the same and it’s much easier. Fan of Oktoberfest? 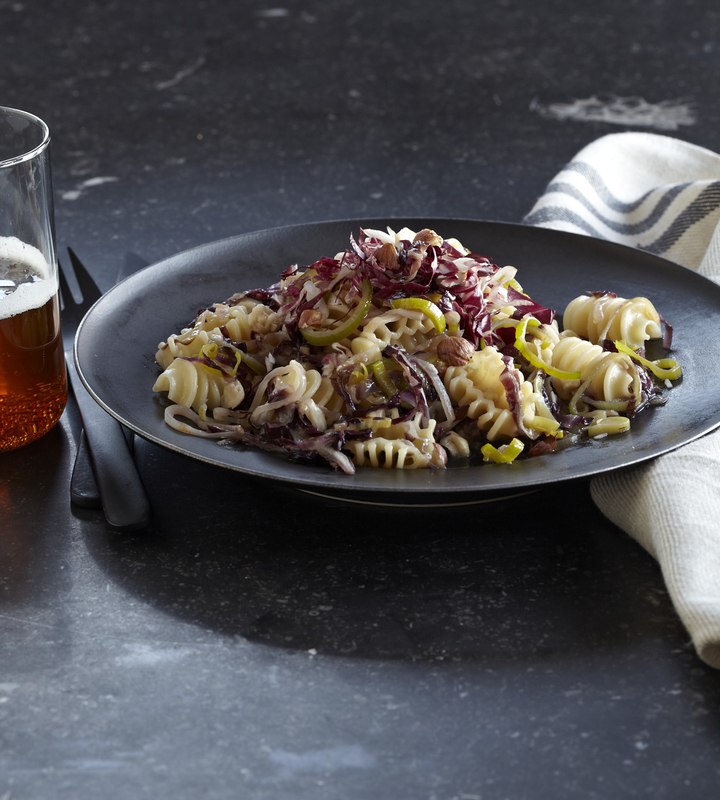 Then you’ll love the last recipe Pasta with Radicchio, Beer and Hazelnuts. I tasted this unusual beer-pasta combination at the annual food festival in Umbria called I Primi d’Italia, which celebrates Italy’s first course dishes. Unique and flavorful, the radicchio rosso di Treviso, affectionately called il fiore che si mangia, “the flower that you eat,” marries perfectly with the beer’s slightly bitter notes. Sautéed leeks add a subtle savory note and hazelnuts give it crunch and sweetness. I especially love it with the pale Italian ale called bionda, “blonde”, but any beer you enjoy drinking would be fine. Fare la scarpetta ----“do the little shoe”--- is an Italian expression said when mopping up sauce with a piece of bread, as it leaves an empty track in its wake. There’s even a cute joke in Italy that references this saying: The prince offers Cinderella the glass slipper but she says, “No thanks, I’m full.” These three satisfyingly rich dishes guarantees to have you fare la scarpetta! Sauté the onion in oil until golden and caramelized, then add the pumpkin and sauté until tender. Season with salt and pepper and keep warm. In a serving bowl, beat the eggs with the Grana Padano cheese. Boil the pasta until al dente, drain and toss in the egg mixture stirring until creamy, then stir in the hot onion-pumpkin mixture. Serve immediately, topped with more cheese. Melt the butter in a large skillet over medium high heat. Add the pancetta and cook until crisp, about 5 minutes. Remove the meat from the sausage casing and crumble into the pan; cook until browned. Add the broth, roast beef, garlic, sage leaves, pear and raisins. Cook the mixture until the pears are soft. Meantime, cook the pasta in boiling, salted water until almost al dente. Drain and toss into the sauce along with 1/4 cup of its cooking liquid. Stir well and cook, adding more cooking liquid, if needed, until al dente. Stir in the zest, 1/3 cup of grated cheese, cinnamon, nutmeg and parsley to taste, until well amalgamated. Season with salt and pepper and serve topped with more shaved or grated cheese and a sprinkling of amaretti crumbs, if using. In a frying pan large enough to later hold the pasta, cook the leeks in 4 tablespoons oil over high heat until golden, about 5 minutes. Pour in the beer, scraping up any brown bits with a wooden spoon. Add the radicchio, reserving a little for use later as garnish, and cook until soft, about 2 minutes. Season with salt and freshly ground black pepper. Cook the pasta in salted boiling water until al dente. Drain and add to the sauce along with a little more beer, if dry. Toss the pasta in the sauce until well combined, then stir in grated or shaved cheese to taste. Serve topped with reserved raw radicchio and chopped hazelnuts.